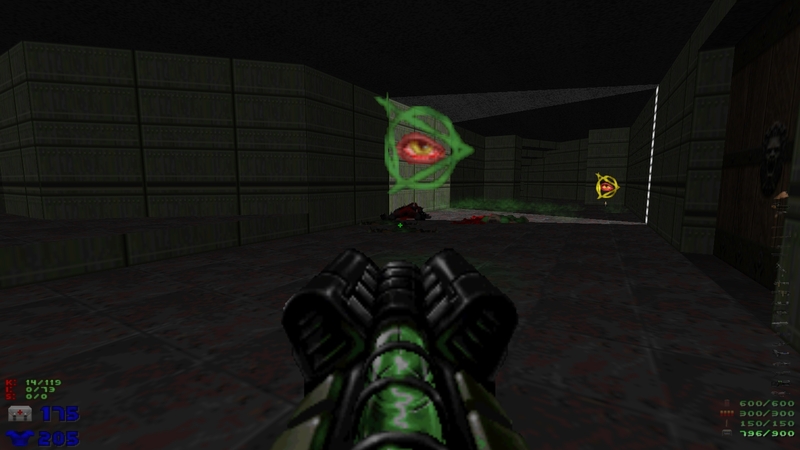 Game On: Doom Upgrade Update #? 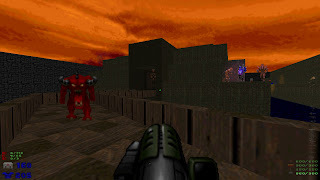 I have other games and mods that I'd like to blog about here (no, I really do) but lately my infamous Doom Upgrade has been the recipient of much attention (a few new gems have appeared in the file's "reviews" section since I last mentioned it here) and I've received some constructive feedback, all of which inspired me to open up the WAD with an editor once again. 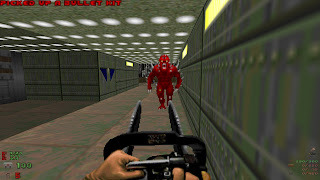 Before I type any further I should mention that my initial attempt to submit the updated version to the DoomWorld/id Games Archives was unsuccessful. I won't bore you with the minor details, but suffice it to say that the whole FTP thing is something else I think the Archive needs to abandon and join the rest of us here in the new millennium. As a result, the updated version of the WAD is currently only available for downloading from GameFront. -The Hell Squire has been completely removed. Aside from making a squishy sound when he died, he really didn't do much so he got the axe. -The Soul Harvester has been completely removed. In the company of the Spirit Imp he was simply redundant and the Spirit Imp to me is clearly the better of the pair. -I made a few minor increases to the Afrit's speed and to the speed of his projectiles; in the company of some of the other Hell Knight and Hell Baron variants he just felt to me to be a bit inadequate. -I reduced the spawn rate of the Cheshire Cacodemon to a 5-in-100 chance. I can't do much better than that. 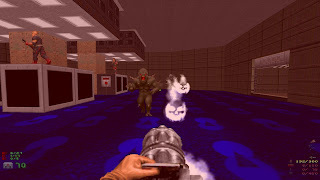 If the Cheshire Cacodemon continues to appear in every map or multiple times in a single map, we'll have to take it up with Randy Heit and Graf Zahl; it's their code and I can only work with what they give me. -I reduced (but did not completely remove) the Specter Shadow lighting effect I had attached to the Blot. On my rig with its triple-core processor, 8GB RAM and Radeon 3300 GPU the effect was causing framerate stutter, so I decided something needed to be done about it. -The plasma used by the Devastator has been increased to 100. I know, I know... that means that even if your backpack is full you'll only get 9 shots with it, but it really is a weapon that's on the borderline of cheating and this way we'll be forced to save it for very special occasions as I feel it should be. Besides, the rapid-fire BFG eats up the plasma pretty darn quick, so it seemed odd that the Devastator did not. For the few of you who have actually used the mod and are interested in the updated version, I need to mention that two "actors" were removed in this update so it may or may not be compatible with saved games that were recorded with the previous version. Since only two monsters were removed, there's actually a good chance that it will work with a game you have in progress, but if one of those two monsters were spawned in the map where you saved your progress it'll be a definite no-go. All I can say is give it a try; I got lucky and didn't need to restart the MegaWAD I've been playing. Well, that's pretty much it. I'll let you know whenever I'm able to get this (and my last music WAD) accepted by the Archives. Until then, thanks again for your support and feedback! Oh, and not that is will probably matter much, but I felt the need to leave another comment on the mod on Doomworld. I even signed it. I just noticed your comment, as well as the fact that my Bartok Music WAD is now available (which I'll likely do a more official mention of in the days to come). I just hope you realize that you've set yourself up for at least a few anonymous drive-by insults over there. I more or less realized that as soon as I put my name on the comment. So be it. I stand by you in this because I know for a fact the time and effort you put into this project, and the fact that you took the time to make some changes based upon proper constructive criticism should help prove to others that you didn't just throw this together "willy-nilly". Sadly, it won't, but it should. I am also rather protective of my friends, and all this unwarranted and undocumented crap being thrown your way is making me see red (despite all the green around here XD). You are most welcome! The Hunter Shotgun is perfect now. Spawn rate of Ceshire Cacodemon too, had them only once or twice on most maps, if it appeared at all. I still don't like the Hell Warrior, but like the Ceshire Cacodemon it's not too hard kill with certain weapons. Also I found a bug, looks like the Green Mancubus received a 10x boost on health instead of mass. Thanks for catching that one. It's fixed now and the DL link in the post has been redirected to the latest new version. While I was in there I adjusted the HP of the other Mancubi as well, so now they're all more similar. Again, thank you for the feedback and for playing!